Almost 60 MINIs (and Mini) and over 100 people showed up at Patrick MINI for breakfast and a presentation from BSSP and MINIUSA. They shared insight and information about MINIs marketing strategy and direction as well as some sneak peeks of upcomming advertising. We hit the road for a 50 mile tour of some great area backroads. A few morning sprinkles kept the driving interesting. After heading back, we enjoyed a cookout lunch and a chance to hang out and visit with friends. Huge thanks to BSSP and MINIUSA for comming out to share information with us (and b-fast), Patrick MINI for opening up and hosting this event on a Sunday, Pat for planning the fantastic drive route, and CMMC for the lunch!!!! If anyone has links to event photo’s, send me an e-mail to steve(at)chicagominiclub.com and I will link them here. The Chicago MINI Motoring Club is 3 years old!! July 12th celebrates the third anniversary of our first formal club event, a drive starting downtown, and heading up Lake Shore Drive and Sheridan Road. Huge thanks to all who have supported our club by joining and participating in events. First off, the Craven Speed Mini is finally back from an east coast tour of events culminating with Mini Meet East. It was a logistical nightmare, but we got a great response to our products, so I think it was well worth it. Down to business… Craven Speed is offering a manufacturer’s $20 mail-in rebate on our Signature Series 15% Reduction Pulleys from July 1st-31st of 2006. This is a great opportunity for the late-comers to upgrade for $89 after the rebate! Now that the development car is back in the hands of our engineers, we’re poised to release a few more products. Look for our NAV version of the FlexPod modular gauge pod very shortly. And some other things that I won’t reveal just yet, so keep your eyes on the Craven Speed website. Finally, I would like to invite any and all to visit our representative at Minis in the Mountains to get a FREE Craven Speed Antenna!! 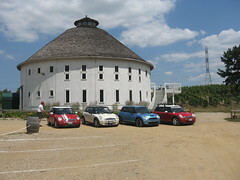 Four MINIs took the scenic and twisty drive up the back roads to Kalamazoo Michigan to participate in the Mad Dogs and Englishman car show. We had a Saturday evening meetup and meal with members of the Michigan MINI Club. Sunday brought fantastic weather and almost every type of British cars that you could imagine (and more MGs and Triumphs than you could shake a stick at). There were about 40 MINIs (and Minis) participating, ranging from bone stock to custom painted to 300HP turbo-charged creations, and every mod in-between. Besides showing off the cars, and judging numerous categories, there was a chance to play a few field games including a casual autocross, a bucket racce (the driver is blindfolded, and the navigator needs to give directions to complete a slow speed slalom), Motor polo and others. It was a blast to hang out with the Michigan club and enjoy tons of British cars! !